Kuwait, 24 October, 2017: The GCC has an enduring obsession with supercars and some of the world’s fastest and most expensive models will turn regional admirers’ heads on the Boulevard of Dreams - a dedicated supercars zone - at this year’s Dubai International Motor Show, which runs from 14-18 November at Dubai World Trade Centre (DWTC). With tens of thousands of car enthusiasts set to descend on the five-day mega event, which is firmly established as the Middle East’s premiere automotive industry event, the Boulevard of Dreams – one of five specialised sectors at the 14th edition of the biennial show – is guaranteed to draw huge crowds, from serious car buyers to aspiring owners, petrolheads and car-mad kids. “The region has long been synonymous with luxury and supercars, and the Dubai International Motor Show is the only destination for serious car buyers and general car enthusiasts to see all the latest models and concepts that will be making noise and turning heads on roads around the world in the future,” said Trixie LohMirmand, Senior Vice President, Exhibitions & Events Management, DWTC. “In keeping with the prestige, glamour and mystique associated with the supercar segment, visitors will be in for a real treat with some big reveals scheduled for the show. The MENA region is home to an ever-increasing number of high net-worth individuals (HNWIs) and ultra high net-worth individuals (UHNWIs). A recent Knight Frank report says the number of UHNWIs in the region grew by 48 per cent from 2006 to 2016, with some 7,370 UHNWIs sharing a combined wealth of USD810 billion now calling the region home. The same report says that Dubai attracted 2,000 new-to-the-city HNWIs in 2015 and so it is little surprise that the emirate’s supercar segment continues to move at a rapid pace, as evidenced by industry luminaries such as McLaren opening new showrooms in Dubai and across the region. 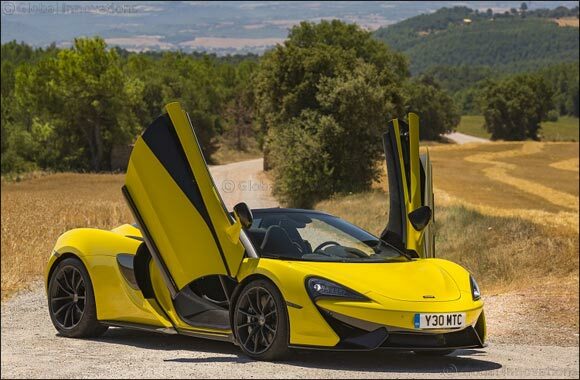 At present, the Middle East makes up 12 per cent of McLaren’s global sales. And Bareis promised there will be plenty to entertain visitors to McLaren’s standing during the five-day automotive extravaganza. “New at Dubai International Motor Show this year will be our 570S Spider, which has all the performance of the Coup� plus the extra exhilaration of open-air driving. We also have another two surprises, but more will be revealed at the show,” added Bareis. McLaren will be joined at the Dubai event by other legendary manufacturers such as Ferrari and Maserati. Eager to muscle in and court maximum attention at the Dubai International Motor Show is Italian automaker ICONA, which will unveil the world’s first handmade titanium supercar – the Vulcano Titanium, which is inspired by and made with the same materials as the world’s fastest aeroplane – the Blackbird SR-71. The Vulcano Titanium is valued at a whopping USD2.9 million. Other exhibitors in the sector eager to show that the Middle East is on track to producing its own eye-catching supercars include Rimac, which will be showcasing its Rimac Concept One – an electric supercar - Prato and Shaali Motorsport, which will bring its UAE-made Shaali N360. The 2017 Dubai International Motor Show is open from 6pm to 10pm on Tuesday, 14 November; 11am to 10pm on 15 November; 11am to 11pm on 16 November and 17 November; and from 11am to 10pm on 18 November. Tickets for the 2017 Dubai International Motor Show are now available online starting from AED 50, a 25 per cent saving. On-site tickets start from AED 65 for single-day entry or AED 100 for a two-day ticket, with children under 12 entering free. Children under the age of 16 must be accompanied by an adult.